The concept: After the ‚spacebound' 2008 releases 'Reflections From The Future' and ‚Space Harmonics (EP)' the 2010 album ‚Through The Gates Of Nocturnal Sleep' shows more of a gloomy introverted and profound inside. The album concept involves the theme of an inner catharsis undergone during the transition from life to death – coming home. The album escorts through these gates of nocturnal sleep, a metamorphosis of transience and renewal. The 'nocturnal' leitmotif shall be deemed as a continuative symbolism of an inner romantic transfigured darkness. 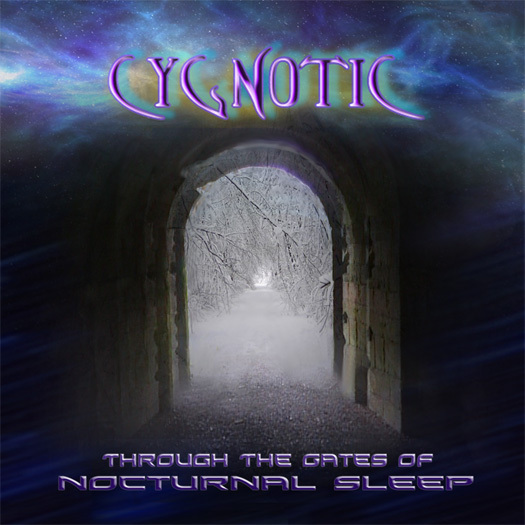 This internal landscapes of the mind underlay the Nocturnal Sleep-album with all the typical mood-evoking cygnotic aspects of time, eternalness, melancholia, euphoria, harmonics, resonance and all those pulsating elements floating within. The epic synthesizer compositions are accentuated and completed by the motif of speech that is used in a versatile way within the context of the album. These spoken words underlay the theme with philosophical key sentences, mostly inspired by Nietzsche and Schopenhauer. These scattered passages create an own correlated interpretation in between these elysian fields of light and shadow; culminating in the epic epilogue ‘Heimkehr' ('homeward'). ‚Through The Gates Of Nocturnal Sleep' – a creation for All and None. From the first upcoming melancholic feelings of leaving to the wistful last reflections of noble and sublime instants in the glittering moments of bliss until reaching the Gates, imperative to cross in ulterior longing. The music: The album is densely packed with familiar 'cygnotic' fabrics of synthesizers and epic electronica-compositions that take the listener on an intensifying ride through a dark layered passage into the light. The compositions range from classical old-school-associated synthesizer-hymns (Indigo Clouds, Knight Moves, Beyond The Light) over progressive psytrance-colored (East Of Eden) and electrogoth-saturated (Nocturnal Sleep) dancefloortracks up to smooth floating, narrative and sometimes quite unusual poetic creations (Through The Gates, Cerebral Standby, Sublight Assimilated, Heimkehr). The boundaries of musical genres are blurred quite naturally in a single harmonized sphere. An important emphasis on this album is the transformation of an emotional state within the music; realized by the musical structures and the essential resonance of the receiving listening countepart. Each of these nine tracks represents one of these gates that have to be passed during the transition from life to death. From the first upcoming melancholic feelings of leaving to the wistful last reflections of noble and sublime instants in the glittering moments of bliss until reaching the gloomy gate. But this passage demands catharsis and confrontation with thy inner darkness – that nocturnal slumber, assimilating the last cycle of life. 'Through The Gates' turns the album from light to shadow. Halcyonic moments of transformation inside the Nocturnal Sleep. A standby within cerebral contemplation; perception in aware acceptance. Not to get lost into the sublight but to arise and to find salvation and deliverance beyond ....homeward.